If you haven't already, it is time to choose your holiday greeting card. In the past, many people choose the lengthy letter detailing every moment of the former year. Then Facebook was created, and status updates replaced the need for the lengthy Christmas letter. Many moved on to the adorable family photo Christmas card. Some people stressed about which color scheme to choose... or which family pet to include. Definitely go with the goat! If you are looking for something more meaningful than the standard Christmas card options this year, consider giving a Card for Compassion from Little Chicken Design and Communications. While my introduction was silly, these cards go to support a serious cause. This year Little Chicken Design & Communications is starting the Cards for Compassion program. Four holiday card designs were created and will be sold with profits going to Compassion International's Leadership Development Program. At least $5.00 will be donated for each packet of cards ordered. Your contribution could help release kids from poverty around the world. Cards are sold in packets of 20 with 20 envelopes for $16.00 (shipping included). 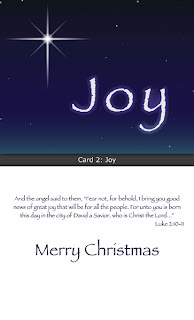 My favorite is this card that simply says "Joy" and includes the scripture verse Luke 2: 10-11. It's a beautifully designed card and shows the excellence of Little Chicken Design's work. To order now go to www.littlechickendesign.com/cfc.html. and be a part of releasing children from poverty around the world. Disclosure: I was not compensated to write this post. These are my honest opinions. I personally know the owner of this business and she has such a heart for giving back to children in need. She has traveled with Compassion International to see their work in foreign countries and has even visited their corporate offices. I'm passing this along because I want to help support her mission. I think what your friend is doing is great. Hopefully she'll do it next year too.